So our weekend journey last week took us to another former park aside from Cascade Park in New Castle, PA that we visited later on in the day. 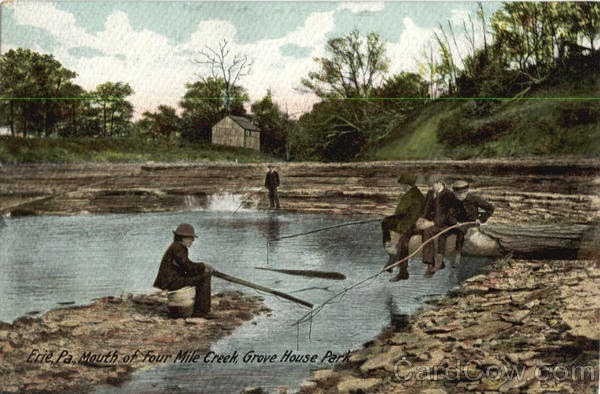 The park was called Four Mile Creek Park and it was located at the end of one of the many Steelhead Trout Lake Erie Tributaries. This park was on the way for us from the Fredonia, NY area to Waldameer Park in Erie where we went for a wonderful and relaxing afternoon. Similar to many parks, this park had a direct rival in the same region/city and it got the short end of the stick, similar to some of the other parks that we have talked about, including Allentown's Central Park, a park that was in crosstown competition with Downey Park, West View Park, which was in direct competition with Kennywood and a bunch of other regional parks, and others. As with most (if not all) parks in this time period, it was a place where some amusements were built in an area where swimming could also occur. I would like to extend a special thanks to Erie History and Memorabilia for letting me use their photos. Information is scarce about this park. It has been closed for 95 years. Nowadays there is not much to see. A golf course is located on the entire site. This is the end of the road through the golf course. I did not take too many photos for there was not much to see. I read a comment on a page (not verifiable) that stated the only remnants from the park are located in this spot. A Ferris Wheel is supposed to have occupied this spot and a stairway/pathway is remaining. We did not get out of the car though because we were driving through the Golf Course Road and thought it would be best to move along. This is the view from the road. It is pretty grown in, but the creek is located here. Anyways, this park was not exactly lucky by any means. This is from a 1908 issue of Billboard Magazine, then based out of Cincinnati. 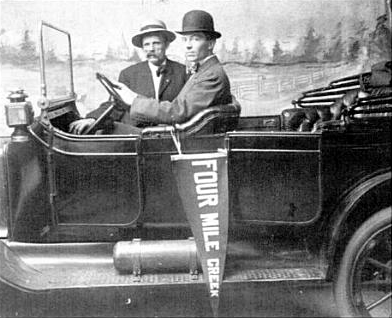 Billboard served partly as a news source for park news in this time period. 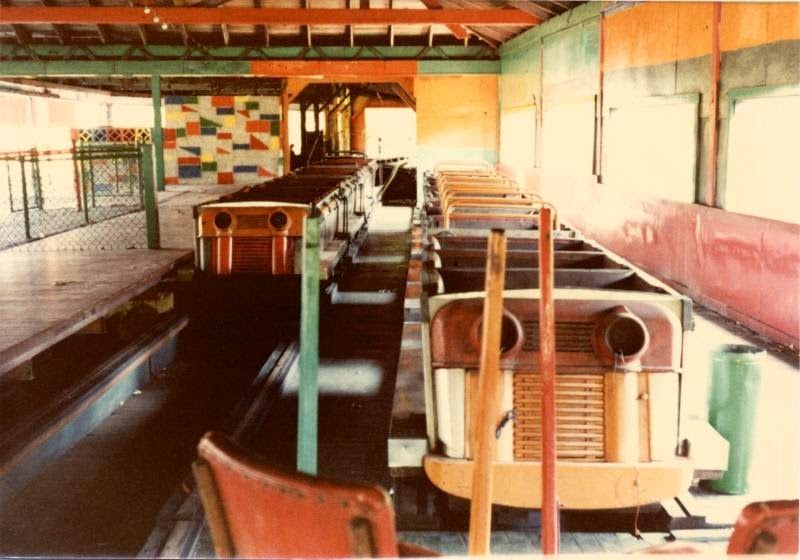 Four Mile Creek was a trolley park built in the opposite direction of Waldameer from the urbanized area of Erie. 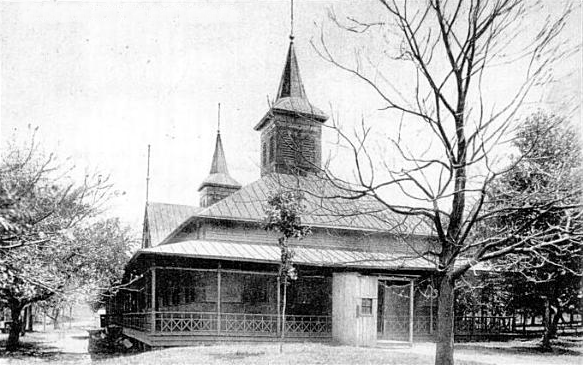 It was built in 1902, just six years after Waldameer. 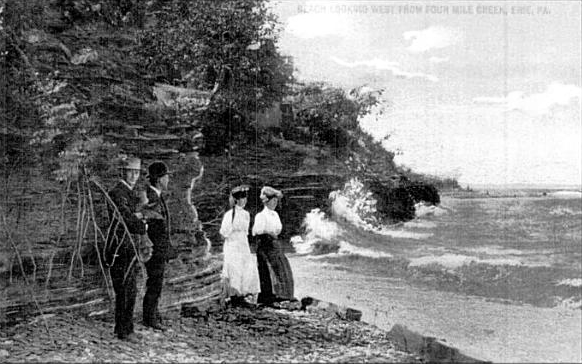 The park was devastated by a major flood in 1915, the Millcreek Flood of August, 1915. 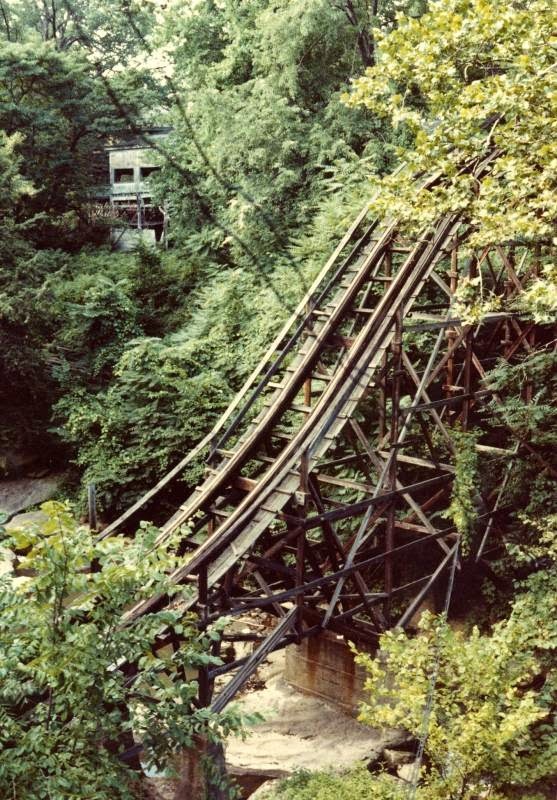 The park's wood coaster, seemingly similar to the Lakemont Leap the Dips, was a goner. That pales in comparison to the devastation that the city saw. "Erie today realized the extent of its calamity for the first time. Yesterday the flood meant a magnificent spectacle for some; a hard search for others; and for many, a gruesome search through the morgue for missing friends or relatives. Today it is the same to all. A loss of perhaps a dozen Erie citizens; damage estimates to be close to five million dollars; several hundred families homeless and a two-block section the entire length of the city, devastated. The excitement of the flood and the attendant scene of wreckage now mean homes gone forever, after years of close saving had made them possible; business plants demolished after hard work had placed them among the most prosperous in the city; and a part of the beautiful city of Erie in ruins. This devastating flood came from a huge storm that dropped six inches of rain in a short period of time. Hundreds of homes were destroyed and dozens of lives were lost. “I could hear the rain and the roar of the rushing water; but it was dark. There was no moon, so I could see nothing. When the morning came we hurriedly dressed and as soon as the light broke we were eagerly looking for the creek. We saw with surprise and some fear that the water filled all the valley above and, running across the road extended up to within a few feet of our door-step. 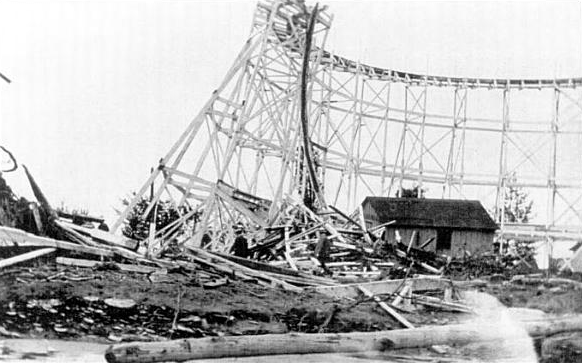 The park somehow plugged on through, without a coaster, until 1919 when a fire burnt the entire park down. The movement towards Prohibition was at full throttle at this point, and this park was a "wet" park, meaning it sold alcohol. Waldameer was a dry park at this point. Prohibitionists were known to go in and smash any booze serving establishment and sometimes even torch them. I have not found anything about what the cause of the fire was, but maybe the Prohibition movement had something to do with this. This is just pure conjecture though. I will leave you off to some happier times for the park. The first photo is of the Ballroom, located on the Lake Erie shoreline and the second photo is of some folks fishing in Four Mile Creek. Here are the remains of the old Cascade Park in New Castle, PA. It was an old Trolley and Railroad park that was located in what possibly was one of the most beautiful locations of any park I have seen. It was set in and around a large gorge and even included a coaster built into it. 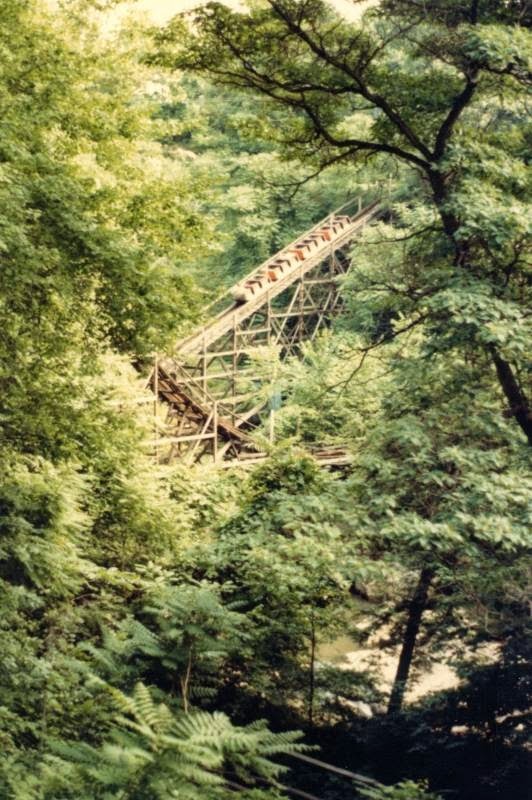 The park opened in 1897 and closed in 1982 when the Rust Belt's decline was in full gear. In 1934 the park was given by the original owners, Penn Power (originally the New Castle Traction company) to the city of New Castle. This region was hit hard and many signs still remain of this in the area, with closed businesses all around. Nonetheless, through regional efforts, several of the remaining structures from the park were restored to help create a natural area for folks to relax, with a plethora of different buildings making the grounds an excellent place for picnics. Let me just start by saying how surprised I was at how well restored and preserved the park buildings were, including the carousel shelter, the train ride's old station, some old food stands, the old ballroom, the tumblebug's old station, and more. One of the most beautiful remnants is the old carousel shelter. This once housed a Philadelphia Toboggan Company carousel, PTC 61, that previously resided at another lost Rust Belt park, Youngstown, Ohio's Idora Park. It currently operates at Brooklyn Bridge Park in Brooklyn, New York. You can read a wonderful account about the carousel's restoration at this link. The park's train ride station was once located in this building. This is the park's dance hall. It seems like the roof is being replaced right now. An Eagle Scout took the time to create historical markers all around the park. It was pretty cool to see. We even ran into a couple that read one of the signs and was surprised that an amusement park was once located at this location. This is a photo of what the train looked ride looked like. You can see the station in the background. 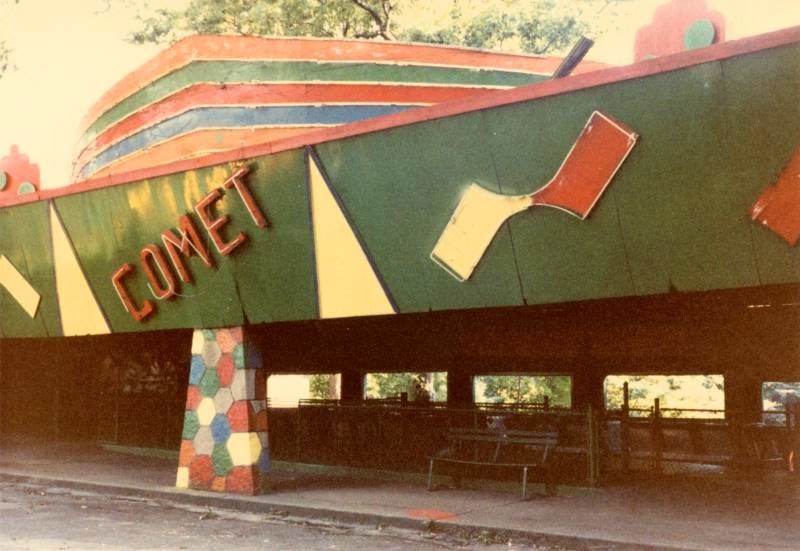 Now for what I came to see, the remnants of the NAD built, and Paul Vesco designed, Comet. Paul Vesco was also the owner of the park and he designed the ride as well. This was my first glimpse of the remnants of the ride. This is down in the creek gorge. You can see where the coaster crossed the creek with these remaining footers. Now as I went further I saw this large gorge! 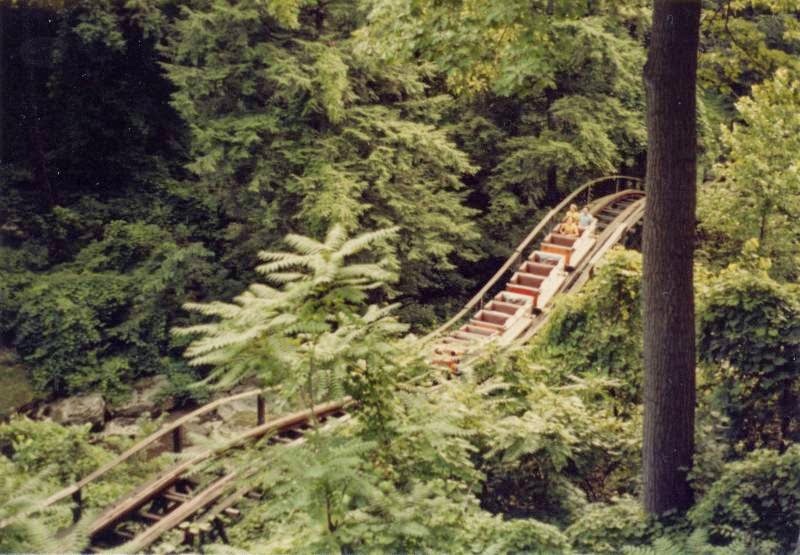 The coaster was built into the gorge, creating one of the coolest settings I have seen for an amusement park. Here you can see a closer view of the footers. I can only imagine how difficult it was to maintain this ride in regards to flood damage. Here you can see the coaster. My goodness that looks like one heck of a ride! The following photos are from RCDB. You can see the classic NAD rolling stock. Some of these shots are from the coaster in abandonment. I am not sure if this pool remains from the park days. It seems like it does, looking like it came out of the 60s or 70s. Down and to the left of this shot is a large swampy area that was once a lake that housed many recreational activities. The dam breaking that held the lake proved to be a big blow for the park. The area is heavily wooded in addition to being located around a beautiful creek. I am also unsure if these pavilions remain from the park. Back to the old Dance Hall. These buildings are historical and priceless and I hope they remain preserved in addition to having a ride or two added again someday. Here you can see some remaining concession buildings. I was shocked at just how much remains from the park. It is almost as if they could put in a few rides and it would be right back in full operation. Now for a closer look at the carousel building. I would love to see this park come to life again, but that sort of time of prosperity for the park has faded like the fortunes of the many towns of the Rust Belt. This seems like a lovely place to have a relaxing picnic or gathering. 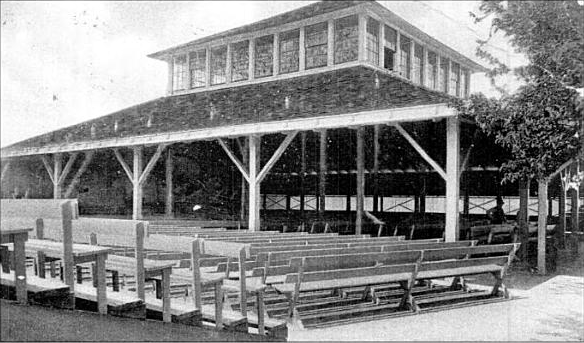 The structure is very similar to other remaining old time shelters such as the Conneaut Lake and DelGrosso buildings. A look from the distance at the old train station. This area has become a memorial to public service. This is a memorial to the young men who served in the CCC, Civilian Conservation Corps, a New Deal program and Great Depression era initiative that enlisted young men to improve our communities. The program instilled a work ethic into our young men, the same folks who would go on to restore world stability in World War II and create our nation's period of greatest all around prosperity. You can see one of the CCC projects in a post from this post on our other blog.. It was pretty grown in, but I believe this may be a chimney from an old building. This could also be related to the roller coaster. Does anyone know what this is for sure? Behind the CCC statue you can see this old concrete pad. It appears to have once been a queue line. 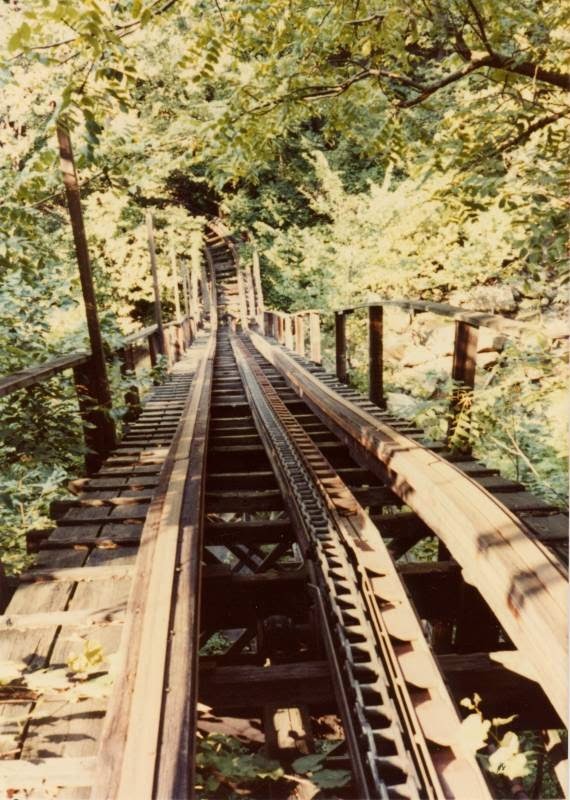 Which ride did this lead to? A view of the concessions and dance hall in the distance. You can also see some flags that have been placed for Memorial Day. This park seriously looks like it could be a functioning park again if they decided to install a few rides right away. Here is a soldier memorial. Old gate from a previous alignment of the main street? The placement of the dance hall at the top of the hill makes for a bunch of different views. I posted the photos in the order that I saw the sights so think of this post like a walk or drive through the park. As I said earlier, this park could probably add a ride or two right away and not have to make many aesthetic changes. It eerily looks like it is just waiting for rides. The region has taken great care of the buildings and park area. Folks were walking around the grounds and relaxing. It would be great to hear a carousel organ's music emanating through the gorge or hear thrilled riders whirl by on a ride again. 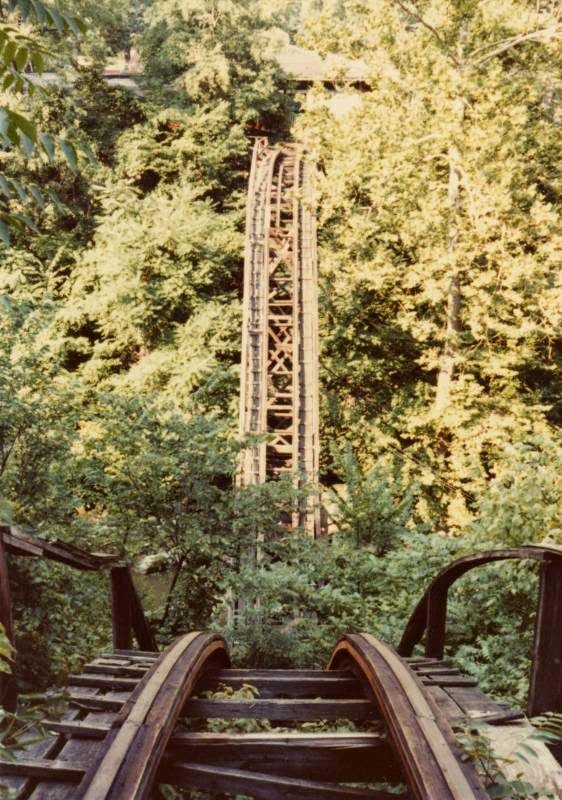 I wish I had the opportunity to visit this park, but I am just a hint too young to have visited this, or the many other Pennsylvania amusement parks that were lost during the 1980s. I sign off of this post reminding you of the importance of preserving the parks that we have. As I have mentioned before, both Conneaut Lake Park in Pennsylvania and Rye Playland in New York are threatened. They both need our support this season. Rye Playland already opened for the season and Conneaut opens this weekend. Get out and support these parks so we do not have to say that it is too late. Favorite Pre-1941 Coaster Poll Results!